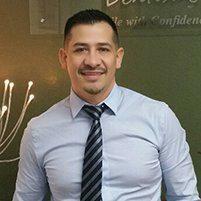 Dr. Zamora provides modern root canal services to help preserve the natural teeth of his patients from his modern and comfortable practice in the Mission District of San Francisco, CA. A root canal is a dental treatment where special tools and techniques used to remove damaged tissue, decay and debris from the interior of a tooth. This procedure treats the pulp inside the tooth, where blood vessels, nerves and connective tissue keep the tooth health and firmly attached to the jaw. When this soft interior becomes infected or begins to decay, it must be cleaned out and seal, like a normal cavity. In some cases, once the root canal is complete a crown may be installed as additional strength and protection for the tooth which may have been weakened from the decay and the root canal procedure. Modern technologies and pain management techniques have made root canals more comfortable than many patients expect, since they have a reputation for being invasive and painful. A root canal is typically completed during one or two visits to the dentist, depending on the condition of the tooth. The treatment is similar to that for a regular cavity. First the tooth and surrounding area will be numbed with a local anesthetic. Then the dentist will employ special instruments designed specifically for root canal treatments to access the decayed interior of the tooth to clear away the damaged tissue. Next, the interior of the tooth itself is sealed to prevent anything from entering and potentially damaging the lower portion of the root. Finally, a filling will be carefully applied and shaped to protect the tooth. In some cases, the dentist may decide to install a crown to protect the tooth and a temporary covering will be placed over the treated tooth until a permanent crown is ready. When the crown has been created, it will be attached to the tooth with a very strong bonding agent to provide additional strength and protection. Patients may experience some minor discomfort following the procedure, but it should be manageable with over the counter pain killers. Will My Tooth Require Special Care After a Root Canal? Directly following the root canal, you may want to take over the counter painkillers or apply ice packs to reduce any residual tenderness. Some patients prefer to avoid biting down on or using the treated tooth for a day or so. Once the initial tenderness subsides, it is important to clean and maintain the tooth as normal, with regular brushing and flossing. Even if a crown is installed to protect the tooth, the surrounding teeth and gums will still need to be cared for to prevent further decay or damage.